The new Huddersfield Leisure Centre is the biggest in the district and is a great asset for local people. It will help them to improve their health and wellbeing as well as attracting visitors to the town. The new £36m facility at Springwood replaces the old centre in Southgate. It includes a 25-metre, 8 lane competition pool, a multi-activity teaching pool with a full moveable floor system, a beach area leisure pool with multiple interactive water features and river ride, a spa pool, a children’s pool with themed animal features, a GRP flume and an exciting ‘Sidewinder’ ride. The centre also has two sports halls, a climbing wall, squash courts, martial arts facilities, a large fitness suite, a café and a children’s area. 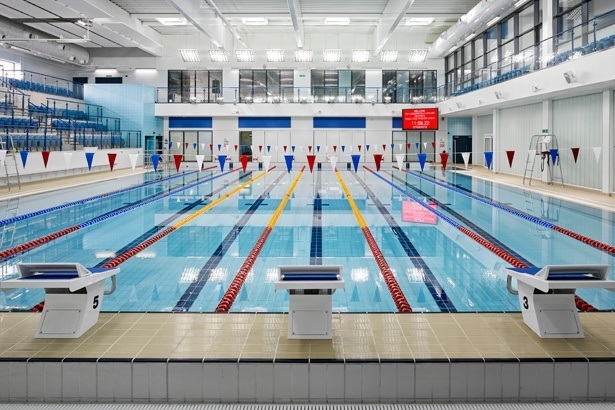 F T Leisure was the principal sub-contractor responsible for water treatment, water features, flume hydraulics, moveable floor and disabled access systems. Each pool has a dedicated water treatment and filtration system based on traditional medium rate sand filtration with disinfection, pH correction and UV sterilisation. The whole programme centred on the construction of the pools and the main contractor had to dig down to rock level, about 4 metres below ground, and remove some 12,000 cubic metres of earth weighing 30,000 tonnes. There were also restrictions on the use of the type of concrete construction which was needed for the pools and it was vital to get the workmanship and sequence right to avoid shrinkage cracks or leaking.